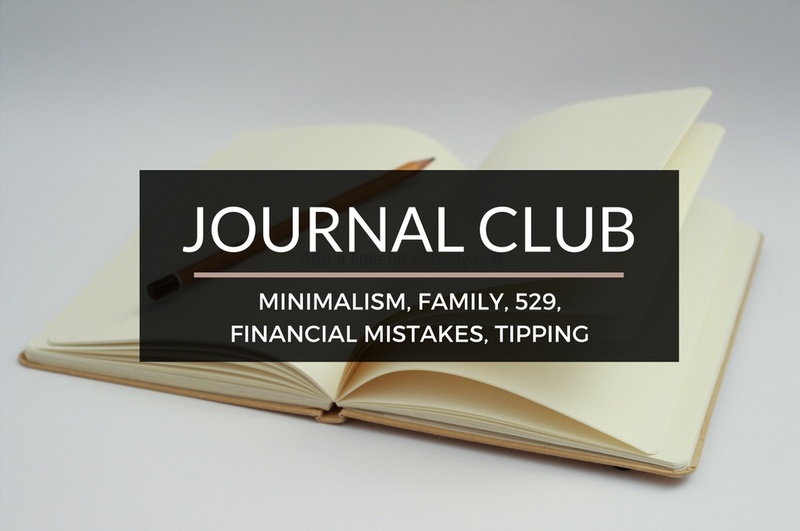 Journal Club 10-1-16 | Passive Income M.D. Okay, there is so much amazing content on the web that I’m reading on a daily basis. I just couldn’t keep the Journal Club to one topic anymore. I feel like I want to share so many fantastic posts that have had an impact on me and cover all sorts of important topics. With that being said, here’s our Journal Club for the week. When I first heard my wife talking about Marie Kondo’s book, The Life Changing Magic of Tidying Up, I was immediately suspicious. I thought it was just another way of telling me to clean up my stuff. But then I read it for myself and it was powerful, enough that I spent the next weekend throwing out some of my most sentimental torn-up T-shirts that I never wear. I really enjoyed reading Physician on Fire’s take on the subject of minimalism in A Physician Takes A Step Towards Minimalism. I love hearing stories about other people’s families. We all have that crazy uncle or cousin and it makes me realize, we’re all the same. In the end, there’s nothing better than family. Future Proof MD cleverly shares about his in Why You Should Not Treat Patients Like Family. I work with residents on a daily basis and I recently wrote a guest post about the financial lessons I teach them. I’ve made so many mistakes and I just want to prevent them from doing the same. Life of a Med Student has a similar mission, evident in his post, Top 5 Financial Mistakes I’ve Made During Residency. Some of you might think I’m being a bad parent by struggling with the idea of funding my children’s 529 plans. Most people I talk to and most everything I read online tell me it’s a no-brainer. It’s not that I’d rather blow that money on myself. I just struggle with whether that’s the truly the best vehicle for saving for their future. Are there other ways I can use that money to better enrich their lives or set them up better? Sounds like Crispy Cabbage (what a name!) thinks about it as well in Forget The 529, We’re Funding Flexibility. The family and I recently went on a short weekend trip to a nice resort. One thing I forgot to bring was cash and I ended up taking a couple of trips to the ATM so I could tip everyone who helped us during our stay. I tipped the valet guy, the bellhop, the person who brought in a crib for my baby, the waiters, the bartenders, the cleaning staff, and many more. My wife tends to think I overtip, but that’s from working in a restaurant oh so many years ago. All that tipping made me think of an article by Wait But Why that I had to reread. Everything You Don’t Know About Tipping is still one of the best and most hilarious posts on tipping I’ve ever read.